Hi Thia. Thank you so much for the awesome book! can't gush enough over the work you did. I LOVE IT!! The colors and images you chose are perfect for me. You really did an outstanding job. 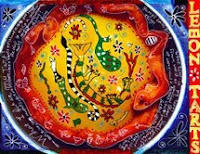 So, I felt the success of this work was because I had allowed myself to become immersed in the process. As a therapist, I learned that in therapy, 'the process is everything.'' So... I'm seeing it is the same for my art, as well! I suppose I’m even more new at collage and crafts than I am always telling people, because I believed I’d made these a year ago. But it’s clear from the date stamp on the photo that I made them mid-year. I was so naïve, when the swap host told us to make 5 artist trading cards, I thought I had to go buy trading cards from a sports goods store, and change them. I also wasn’t aware that the standard ATC is vertically oriented. It’s so funny to me now! These have a lot of sentimental value for me. I remember making them, I remember not knowing what the host meant when she told us to put on the back of each card the ‘standard information’. I remember feeling really dumb about not making two sets so I could keep one. They were hard to let go. But after these, I was able to release my work into the world more readily. I have rarely made extras to keep, but I still want to get into the habit of doing so. These are a project I came up with one morning upon awakening. I was planning to make Valentine’s Day cards for certain people I wanted to RAK to. But I had done a few greeting cards before, and they weren’t my favorite process. I wanted something that would be more flexible, usable, and save-able. And I had recently seen some heart-shaped statuettes in a Somerset publication, and loved them. 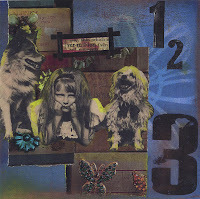 I loved that they were collaged, but three-dimensional, and could stand independently on a table or desktop. So, I’d remembered them for many months. I decided to send out some small hearts that people could wear, stick on the fridge, keep in their wallet, or just throw around like confetti. These are cut from cardboard, covered with paper toweling or tissue paper, painted, glazed, some are embossed, some have embellishments on them, some have stickers. I love them so much I will be making more cardboard confetti shapes and sending them out. Or, making canvases with them. I am fond of them because they were an inspiration. I think someone was probably thinking of me and sent them to me while I was sleeping. This fave is another pair of circles - this time in collaboration with my 12 year-old son Boone. These are photo journal pages - he made lemon tarts from a blog friend's on-line recipe - I photographed the tarts, printed them and he journaled about his day and his tarts -the first one included critters he was envisioning in the tart - the second was the result of talking about how the critters could radiate out from the center - planning and using the circle as a guiding design element - for this one Boone sketched and planned in advance. I love collaborating with my son - we are just returning from a trip where journaling was a big part of our shared activities. These lemon tart journal pages are special in regards to collaborating (the flowers are eb's) and also I love the way the the image is so totally altered by the journaling - becoming something more than the sum of its parts - the way the critters create an edginess to the sweet suggestion of the lemon tart base. I love the various elements - the recipe, the cooking, the documenting, the eating, the printing of the photo, the journaling, the revised second version and now the sharing of the lemon tart journal pages. 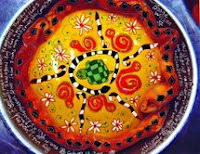 Not only were the tarts a special treat but we have the art tarts now as reminders of the shared sweetness now inhabited by wildly wonderful Boone critters. This was done on the fly, made as one of 12 original pages for a documentation book of a cd swap. (It was #3.) The photograph is one of my signature old photographs; it always makes me smile. and I love how well it works in the spontaneous structure of the page. This is one of my all-time favorite pieces. 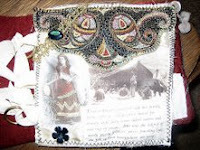 It was made for a postcard swap, the theme being a certain technic. As it turned out, I didn't follow the original technic I was supposed to. This is made from latex caulk, the kind you can buy at the hardware/home improvement store. I love using caulk for texture. Not only do I love the texture of this piece, but I love the colors I used. I love bright and bold colors, and use them often, but I'd never tried this color combination before. But I was trying to break out of using the same old colors I normally used, so this was kind of a risk for me. One I'm glad I took. The unfortunate thing is, I made this for a swap, so I had to give it away. And all I have left of it now is the photo. Sometimes, I must admit, it's difficult for me to part with my art, especially if it's a favorite piece. I wonder, do other artists feel that way? I suppose I could make another one for me, and I might do that at some point, but haven't yet. I was in love with this project when it was just a small idea swirling around in my mind. Gather a group of amazing fabric artists and share our work round robin style. 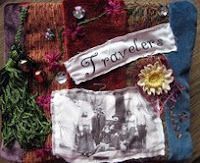 I chose the theme of The Travelers for my book and created the beginning of the book in a crazy quilt style. I love the colors and rich textures of the velvets, embroidery, beads and tassels. I see these as rememberances of travels both physically and through time. My book was sent on it’s way and I only saw photos via our round robin blog www.fbrr.blogspot.com as the other members created their Travelers themed fabric pages to add and I created pages for their books. After a year, my book returned to me. It is truly one of my most cherished collaborative projects. Wow, this project was such a great idea! I've been out of the blog loop for awhile now, but I just love to come here & look at all of this amazing work. Thanks so much for putting it together! Hi Seth I think this project is a wonderful idea! greatly inspired! namaste Elis. Seth, your ability to put the works into perfect categories amazes me. What interests me here are the comments about how special our pieces become to us, how difficult it can be to send them out in the world. It speaks to how much of ourselves and our loves we put into our art. And how nice it is to know that other artists feel this way, I'm not just being greedy :-) I admire the artists here who start their work with the intention of trading them away - I'm not sure I am there yet! Great post. Thanks for sharing! Have you ever heard of SquidNote? It's a fun group greeting card site where you can have a bunch of people sign a card. Perfect for mother's day! You can even add a gift card for everybody to contribute to.